Poster for Hurricane Relief Benefit Jam (From Mike Burton’s Facebook page). 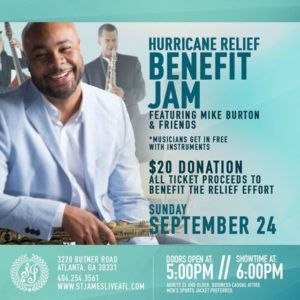 Artist in Residence and mentor of United Jazz Foundation Mike Burton is stepping up and supporting the young people of the USVI by organizing a hurricane relief concert in Atlanta Ga. next Sunday. 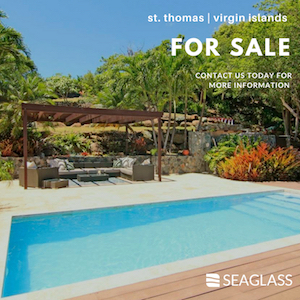 All proceeds will go to re-building the Virgin Islands in collaboration with United Jazz Foundation. 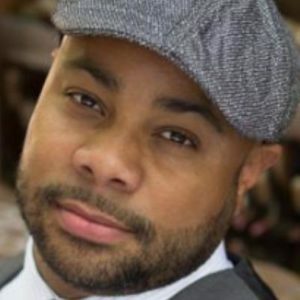 While most Virgin Islanders will be unable to go, it is heartwarming that people like Burton are rising to the task and doing what they can to help out. The Sept. 24 concert will be asking spectators for a $20 donation for the relief effort. But musicians get in free with instruments. It will be at St. James Live, at 3220 Butner Road. Doors open at 5 p.m. and show time is at 6 p.m.
Burton is a native of Jackson, Mississippi. He grew up listening to his mother sing with the Mississippi Mass Choir and accompanying her at church on Sunday, according to his page on the Jazz Network Worldwide (thejazznetworkworldwide.com). His father was also a tenor saxophonist, and really influenced Michael’s appreciation of 1960s and 70s soul music. At the same time young Burton was building his own collection of hip hop and jazz recordings. He says those influences have had a profound effect on his approach to improvisation and composition. Michael received his Bachelor and Master of Music degrees in jazz studies, from Indiana University, where he studied with David Baker. Mike Burton (From Mike Burton’s Facebook page). Crusher, Angie Stone, Janelle Monae, N’ Dambi, Mary Mary, Kirk Whalum, Chuck Brown, Mike Phillips, Jeff Bradshaw, Freddie Jackson, Gloria Gaynor, Russell Gunn, Omar, Nick Colione, Marcus Johnson, Victor Goines, Byron Cage, the Mississippi Mass Choir, and a host of others. Michael has recorded with Polow Da Don, Fergie, Hidden Beach Recordings “Unwrapped Volume 5.0,” Ann Nesby “In The Spirit,” PJ Morton “Emotions, special edition,” Marcus Johnson “Just Doin What I Do,” Alyson Williams “It’s About Time,” Bill Banfield “Striking Balance, and The Mississippi Mass Choir “Amazing Love,” just to name a few. He has also toured with Jill Scott, Anita Baker, Tyler Perry’s “Madea Goes To Jail,” Tyler Perry’s “What’s Done In The Dark,” New Edition, Johnta Austin, Soul artist PJ Morton, and with Blues singer Willie Clayton. He played sax and keys for Tyler Perry’s stage play “Why Did I Get Married.” You can see (as well as hear) Michael play in the motion picture, Tyler Perry’s “Madea’s Family Reunion.” While he was touring with “Madea,” Michael had the honor of playing behind Prince, Patti Labelle, Jennifer Holiday, and Chaka Khan. Michael has appeared on The Tonight Show, Ellen, Jimmy Kimmel, TV One, and BET Jazz, performing on the popular show Studio Jams alongside pianist Bobby Lyle. Burton has also written and/ or produced songs for Alex Bugnon, Terrell Carter, Christian Keyes, Chandra Currelley, and Melvin Miller. Currently, Mike is touring with Mary J. Blige.